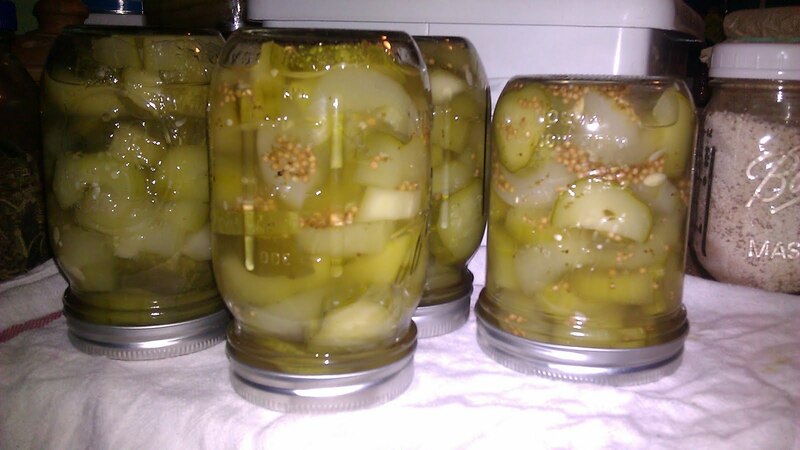 Senf Gurken ~ Quick Pickles for the spontaneous gardener. I am a sporadic gardener, and my hopes are that one year I will actually plan out my garden by companion planting and grouping by harvest time. This year, I planted a few Armenian cucumbers, and two other varieties. A strong hail in the spring demolished much of my garden, so I planted two more Armenians and pickling cucumber. Well, they ALL flourished, and now I have both! With that said, my one spontaneously planted pickling cucumber produces about 2-3 ready little pickles every other day. Not really enough to harvest and do any pickling. So, here is my version of a quick, and yummy, recipe for all you other sporadic gardeners out there! I will include the "original" German version below. Cut up the cucs, salt, and let stand in fridge 24 hours or at least overnight. Drain & rinse salt. 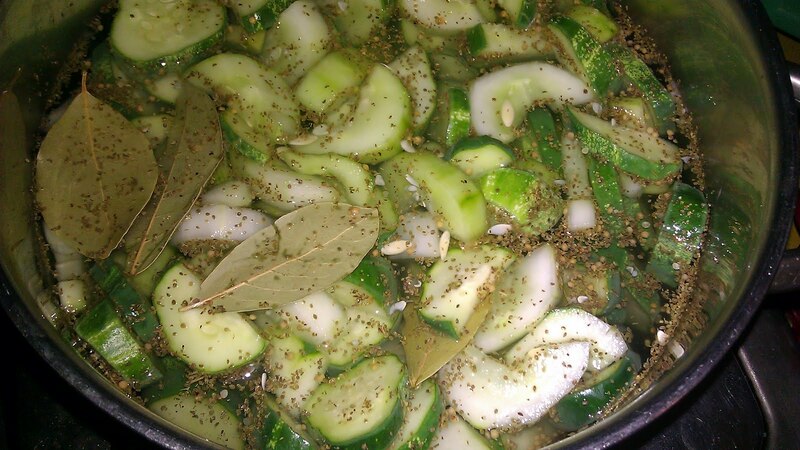 Put all ingredients in a pot, cook on medium-high for 10 minutes, then fill into hot canning jars. Seal, turn upside down on kitchen towel, and let cool. Label, and let sit for at least 2-3 weeks before consuming. Onions can be omitted, if prefered. Die Gurken schälen, von Kernen befreien und in Stücke von ca. 1 cm Dicke schneiden. Mit den 2 EL Salz bestreuen und mit soviel Wasser auffüllen, bis sie bedeckt sind. 24 Stunden im Kühlschrank ziehen lassen. Am nächsten Tag abschütten und kurz unter fließendem Wasser abspülen, so dass das Salz wieder abgewaschen wird. Nun die anderen Zutaten in einem Topf erhitzen und die Gurkenstückchen darin ca. 10 Min. leicht köcheln lassen, sie sollen aber noch Biss haben. Noch heiß in ausgekochte Gläser füllen, mit dem Sud fast bis ganz an den Deckelrand auffüllen. Sofort fest verschließen und auf den Kopf stellen (auf ein Geschirrtuch). Dann auskühlen lassen. Sind nach ein paar Wochen durchziehen zur Verkostung bereit. Wer keine Zwiebeln mag, kann diese ruhig weglassen, der Geschmack wird dadurch nicht wesentlich beeinträchtigt. There are times in my life when I have to do things I really don't want to. Afterwards, I group some of these into "Valuable Learning Experiences". We recently went to the Phillipine fish market. Big bins of fresh fish, lots of people, fishy smell......My son became fascinated with squid, and talked me into buying some to make him Calamari. I have fond memories of Calamari, both from Italy (Frutti di Mare), and Greece (straight out of the ocean into the pot! ), so I agreed. I realized that I have never made Calamari myself, so googled "How to clean & prepare squid". Now you are in for a treat....remove the head and the organs...dig in with your finger and pull out the slimy rest and ink sack....remove the spine....peel off the skin. This leaves you with smelly hands (they say to wear gloves, but I never do. Can't work with gloves on), an interesting biology lesson, and clean little pockets to cut calamari rings out of. Tossed them into some flour, and deep fried. I made a marinara sauce. On the side, we had grass fed beef (not everyone was excited about squid), and a raw squash salad with basil & arugala. That was our 4th of July dinner :). Now that I know how much work & detail go into cleaning and preparing squid, I will only eat it at home :).